The facts: My name is Tina Sutherland, I'm a 52 year old former RN, current grandmother and married to a lucky guy. 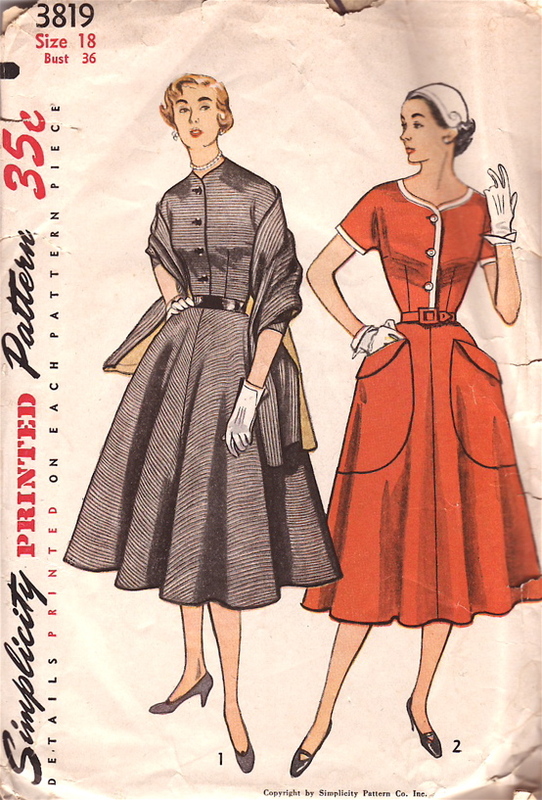 😉 I own What-I-Found – Sewing Patterns. (I'm one of the several pattern sellers at Main Street Mall Online.) I have been selling patterns for about three years, selling online for 10 years. What motivated you to go into the vintage business? I live in an RV traveling full time for my husband's work. He does safety inspections on amusement rides so we go from big cities to tiny towns and I shop everywhere, all over the country. I owned an antique shop in Seattle and sold things online from there, but when we hit the road I needed to sell something small and unbreakable. Patterns work out perfectly, I think they are fascinating and they move with us (all 3,500 plus). What's the weirdest/best/craziest/most beautiful thing you've ever found? The best thing I have found is a letter and I have a dress with iron on details (warning! FAKE POCKETS! —Ed.) that hasn't sold (but I admit I'll be sad when it goes!). What do you dream about finding? I dream about finding boxes of uncut 1920-30's patterns. Oh, and they would be in wonderful condition! What do you enjoy most about working with sewing patterns? Since we move so often it's not practical for me to take a "real" job, so working with the patterns lets me be flexible. I can list a ton or take a day off as needed. So long as I have internet I'm a happy gal. What do you wish someone would ask you about your site? I do wish folks understood that these are pieces of history … a sixties pattern is nearly 50 years old … it's sort of amazing that something made of tissue paper is here and intact. It's a good day at work when … A good day is when somebody discovers the long lost pattern they have been looking for. They are so happy and send such nice notes. A bride finding her exact dress is exciting too. Even when it's a fauxlero dress! If I ran the internet for a day I'd … If I ran the internet for a day I'd issue everyone a sixteen year old to stand by as tech support. The blogs I read (other than ADAD are …) Of course A Dress A Day! Then Lisa, AKA Miss Helene writes Random Acts of Vintage and I'd add Fabulon … it's a treat! You'd laugh if you knew this about me … You'd laugh to see me wearing my pink hardhat hauling steel. Sometimes we move rides and since I have no real tool skills I get the scut jobs … but I can outwork those young whippersnappers. I so enjoyed reading about you and smiled throughout the whole write up… Thank you for sharing your story and also being on Erin’s fantastic Dress A Day blog… Welcome!!! and I will never be able to look at another carnival without thinking of you in your pink hard hat!!! I also am offering 25% off all patterns in my store http://www.antiquedollhouseofpatterns.ca for two whole days since I had a downed server for one week! We always combine shipping. Discount refund will be done through paypal! Nice life traveling around in an RV all the day long….with thousands of patterns too. Wow. I love that her site features a search by bust size! That really saves heartbreak (looking for the perfect dress only to see it’s a 32 or 40 bust! 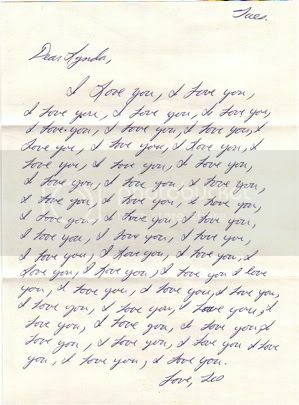 What a perfect love letter! Ooh, thanks for the shout-out, sweetie! My aunt had that fauxlero pattern for her wedding! The groom wore a dark Nehru jacket, so it looked like she was marrying a priest, and the bridesmaids’ fauxlero ensembles (each in a different solid color) involved wearing identically-styled pageboy bouffant wiglets topped by an enormous bow in the same fabric as the dress. that was fun reading. Seeing that fauxlero weddding dress made me “gasp” realize I have fauxleros lurking in my stash. What an interesting life–I’m amazed at the portability of your “shop”–not possible just a decade or so ago. Great post–made me feel as tho’ I know you! that love letter is priceless….could be a fabric print, no? AGH! It’s the sister to the make believe pockets skirt! I had no idea there was a series. I wonder, how many others are lurking out there? Not lurking in my closet yet. I have many patterns in the to sew stack and less in the have sewn stack…so many patterns so little time. I wish that people would stop wishing for uncut 20s 302 patterns. My grandma has been collecting patterns for 50 years and she only has about 10 patterns from that era. If she hasent been able to find more than that I doubt that anyone else is going to find a whole box!